The official name is Llwyn Helyg but local people call it 'White's Folly' after the name of the NPT CBC Chief Planning Officer - Geoff White, who recommended the plans submiited by the developer. The site is located at North Waunceirch, the top of Dwr-y-felyn Road. Built by Waterstones developers who built some shops on the site in 2010, including a Tesco Express, before they started on the 38 high pitched roof houses jammed in an area only suitable for bungalows. The shops, the junior school and community centre are all single story buildings. The two and three story houses stick out like sore thumbs on the ridge top location. 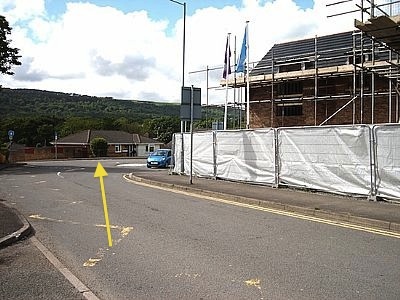 A bungalow opposite, (yellow arrow points to it) had to be that type of building when it was built in 1994 because of its ridge top location - now the new houses tower above it. The houses were advertised for sale BEFORE planning permission was obtained. Shown here is a notice board put up prematurely with a retropective planning application for the notice board attached to one of the supports (shown by arrow). This deceiving ploy gave residents the impression that planning permission was obtained - it certainly limited objections to the development. The most glaring thing in this saga is the major U-turn by the council. In the late 1990's two notices appeared on the main A474 road advising no access to North Waunceirch. One of the objectives being to keep traffic away from the Waunceirch junior school - to the extent they built a barrier which cost thousands of pounds to instal. Shown left is an ambulance crossing the barrier - note the traffic with parents collecting children from the school. Conclusion It shows lack of forward planning by the NPT CBC Planning Department who disregarded the Bryncoch Environment Group and local residents who objected to high pitched roof houses on a ridged top scheme. Also the lack of consideration for the safety of school children and the lack of their privacy with a new build development. Now that the site is built the residents living there are determined to maintain the area to a high standard. Steps are being taken to highlight problems before the site is adopted by the council.